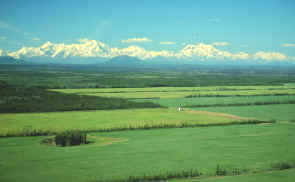 Scenic Delta Junction is located in the broad, beautiful Tanana River valley in Central Alaska. Delta Junction’s scenic setting is part of its appeal to local residents and visitors alike. Our valley is forested and surrounded by the tall, snowcapped peaks of the Alaska Range to the south, and the Tanana Hills to the north. Delta Junction is a major agricultural area in Alaska, and the picture above gives a feeling for the large farms that are an important part of our local economy. Kelly’s is “on the way.” We’re just a short walk from the true end of the Alaska Highway . Here the Alaska Highway joins the historic Richardson Highway that runs from Valdez on the coast to Fairbanks. If you are driving from the lower 48, set your sights on the end of the highway, and we’ll be waiting for you! If you are flying in to Fairbanks or Anchorage, we’re just a scenic drive away. 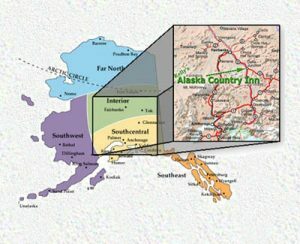 Originally known as “Buffalo Center”, Delta Junction has been a stopover along the Richardson Highway since the early days of the trail between Valdez and Fairbanks. Click on the roadmap for an enlargement.